Many Irish family names start with “Mc” or “O’ ” which mean “son of . . .” and “grandson of . . .” in Gaelic. Iustina (you-STEEN-a) and Thea are best friends and they like to do everything together. They live in the beautiful country of Ireland, located in the North Atlantic Ocean just west of Great Britain [point out on a map]. Iustina was born in the eastern European country of Moldova [show on the map], and Thea was born in the Philippines [show on the map]. Both girls moved to Ireland with their parents when they were six years old. They met in Sabbath School at the Seventh-day Adventist Church in the capital city of Dublin. Sometimes the other children ask the girls interesting questions, such as why they go to church on Saturday. You see, many people in Ireland have found the Seventh-day Adventist Church in Dublin—some have moved there from other countries, like Iustina and Thea. Others have attended meetings to learn more about the Bible, or they’ve visited the health center at the Dublin church and are now coming to the church on Sabbath. After a while, so many people were coming to the one Adventist Church in Dublin they couldn’t all fit into the building! So groups started meeting in schools, hotels, and other places. Part of our Thirteenth Sabbath Offering this quarter will go to build another Seventh-day Adventist Church for the people in Dublin, Ireland. 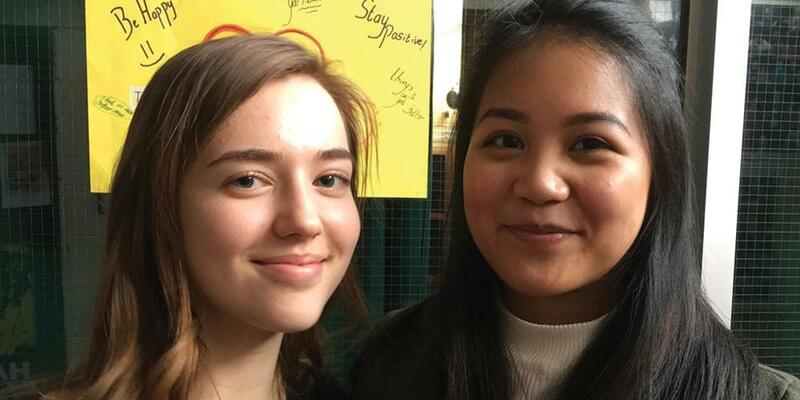 But in the meantime, Iustina, Thea, and other Adventist young people keep telling others about Jesus, and keep inviting them to visit their “church” that meets in a school. “Sometimes on Sabbath afternoons we go to Stephen’s Green (a beautiful park in Dublin) and give out free hugs!” says Thea. “And we give out pamphlets and magazines, such as Signs of the Times. And sometimes we give out Steps to Christ. “We wear green shirts that say ‘Free Hugs’ on them,” Iustina says. “People come up to us while we’re just standing there. It’s really fun! One day I gave 127 hugs! All of the literature was gone, so all we could do was hug! “People ask us why we’re doing this and we tell them we’re from the Seventh-day Adventist Church! After we hug them, the people smile and say, ‘You’ve made my day!’” says Iustina. More and more people are coming to the Adventist groups meeting in Dublin, Ireland. Let’s help Iustina and Thea and the many other people in Dublin by bringing our Thirteenth Sabbath offering to Sabbath School so they can have a new church. Thank you!